Okay, so I've survived another day of work and contractions (more intense, a little more frequent, but not close enough). It seems these last two days have gone by sooooooo slowly. Even sleeping. I keep waking up (not just to go to the bathroom). I look at the clock and realize it has only been a few minutes or half an hour since I last woke up. Well, tomorrow is the day. I go into the hospital at 8:00pm to be prepped for inducement. So, I'll work my normal hours. I'll leave work at my normal time. We'll have a semi-normal dinner (my dad is joining us for dinner since he'll be taking Tristan home with him). We'll give Tristan hugs and kisses before he goes to Grandpa's. We'll double check our bags for the hospital. Then we'll head out. It will be the last time our home will just be occupied by three (plus the cat). It will be the last time our son will be an "only" child. It will be the beginning of a newer family. It will be the beginning of our family of four. It will mark the three month "stay-at-home" mommy-ness that I'll get to cherish (our finance and work situation doesn't allow for me to stay at home - oh, but how I wish I could). Well, in preparation for our newest family member, I decided to get a bit crafty! I fished around for ideas for adorable, handmade birth announcements, took a trip to Archiver's for some cardstock and other essentials, and then, I got to work. So, here's my prototype (please keep in mind, I used my son's picture - he's only a day old in it - I can't believe he was ever that small! - Oh, and of course the date, weight, and height are subject to change). Materials I bought were enough for 60 announcements (you may have to adjust depending on how many you need). 100 count pack of gold paperclips - $1.79 at Office Max (I wanted to get tiny pink ones but couldn't find any at Archiver's :( I'm sure Creative Memories or Stampin' Up! has 'em). Here's what it'll kind of look like (I didn't use the tan cardstock for my prototype since I don't have all of baby's stats yet). I have instructions after the images if you'd like to re-create it. Its a great idea I found in a scrapbooking catalog (Scrapbooks etc. - Baby). Using a paper cutter board (I use a Fiskars paper cutter - very basic one, nothing fancy) cut out 6 retangles from the 12"x12" cardstock (each measures 4"x6"). If your paper cutter has a scoring tool, score your cards at 2.75" (this will leave a bit of a lip at one end when folded which will be trimmed to look like a file tab). Note: if you score at the half mark (3"), then you won't have the file folder effect. Using your scissors (unless you have a tool that can help with this), trim the lip to look like a file tab (as shown in second picture). Using Microsoft Word or some other software for writing up text, create the inside print. Your text box needs to measure at most, 2.5"x3.5". I found a free typewriter font online, but you can use whatever font that suits your fancy. Name, Date of Birth, Description, Accomplices (aka Mom & Dad), and suspect profile - click on the image to bring up a larger version to read the text. You should be able to fit 9 copies of the text box on one 8.5"x11" cardstock. Print 7 pages with 9 text boxes on each on tan cardstock. Test print on regular paper to be sure the dimensions are correct and that your printer doesn't cut off any text. 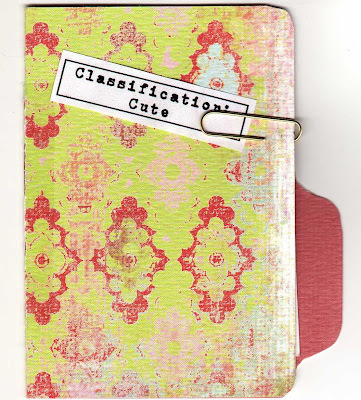 On the last piece of cardstock, you will print out 60 text boxes with the words: Classification: Cute (or some variation). I suggest putting a border around the text box so that it looks like it was stamped on. 1.5"x.5" is plenty big (you can go smaller). Fit at least 60 copies of the text box on one sheet and print on tan cardstock. Using paper cutter, cut out the text boxes just printed. Using double stick tape adhesive (or some glue dots if you prefer) to adhere the front cover text box and inside text box. I suggest having the front cover text box at an angle (as shown in first picture). 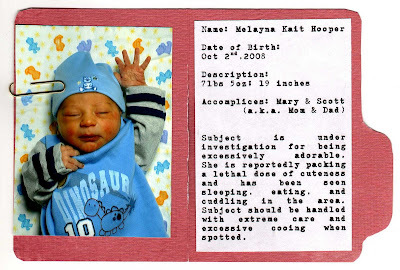 Using paper clip, clip baby's picture to inside of card (don't adhere - using a paperclip gives the recipient the option of taking the picture out and putting in his or her wallet or album). I suggest using a black & white photo or sepia toned since it would add to the classification folder effect. My son's picture doesn't really go with the feminine tones, but you can see how the colors can easily clash (even if it was a little baby girl's picture). You can do these on a larger scale (to fit 4"x6") but paper usage goes up, photo printing cost goes up, and you'll have to adjust your measurements. Since most people only mail out wallet size, I figured that these mini announcements would still create a big impact. Let me know what you think. I'd love to find out if this is good idea or not. Super cute! What a good idea, I wish that I would of thought of something like that for announcements. Good luck getting through the day!! You will be holding your new baby very soon.